Countless forests have been felled to produce JFK assassination books; similarly, no trees are safe from “Ripperology,” with new hypotheses coming out annually and showing no signs of abating. 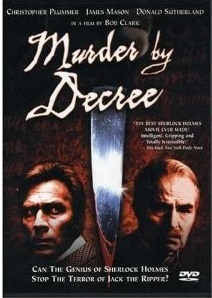 Murder by Decree is a 1979 thriller about the Jack the Ripper killings, directed by the legendary Bob Clark (Black Christmas). It has Masonic elements, a la the highly-touted book They All Love Jack: Busting the Ripper, by of all people, Bruce Robinson, the guy who directed the excellent Withnail and I. Robinson told The Guardian newspaper that Jack the Ripper’s mutilation MO was inspired by a foundational Masonic myth associated with the temple: the ritual punishment of three Jewish craftsmen – Jubela, Jubelo and Jubelum – condemned to death by Solomon. The mystery surrounding this cryptic phrase has been hotly debated. In this film account, Sir Arthur Conan Doyle’s inseparable creations Sherlock Holmes and Watson are the “damn consulting detectives” (as one Scotland Yard honcho puts it), wading into the investigation surrounding who butchered Whitechapel prostitutes in 1888. Perhaps unsurprisingly, as this is director Bob Clark, we get some Black Christmas-style POV shots from Jack’s perspective. Sherlock Holmes, played by a casually charming Christopher Plummer, is called into action by a mysterious Citizens’ Committee on Jack the Ripper’s trail who suggest “if it was rich women who’d struck his fancy,” the case would’ve drawn more interest. This cynical sentiment carries on right into present day with a Canadian example being the Highway of Tears murders. Holmes is ever a jokester, gently ribbing Watson (the redoubtable James Mason) over the old codger’s supposed ways with the ladies. 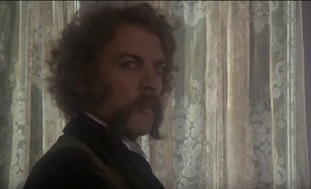 Also here, Donald Sutherland as oddball spiritualist medium (and historical footnote) Robert Lees, who as a teen once claimed to have relayed posthumous messages from Prince Albert to Queen Victoria! Sutherland’s wonderfully over-the-top, sporting a giant walrus mustache and conveying messages to Holmes and his bemused sidekick about his “visions” regarding who’d perpetrated the gruesome killings. Murder by Decree is a fun period-accurate procedural with nice suspense. It’s also the first film that scared the pants off this reviewer, so it was a joy to revisit. Murder by Decree has across-the-board fine performances and choice lines (“We’re grappling with a dark intention”) and is well worth a look. This entry was posted in Horror and tagged 70s movies, Canadian film by Really Awful Movies. Bookmark the permalink. I enjoyed this film quite a lot, especially James Masons Watson (the pea monologue is so funny) however, it didn’t do much to dispel the characterisation of Watson as a bumbling country doctor.